Steve Galloway’s blog recently drew my attention to a planning application due to be decided this Thursday (6 April). 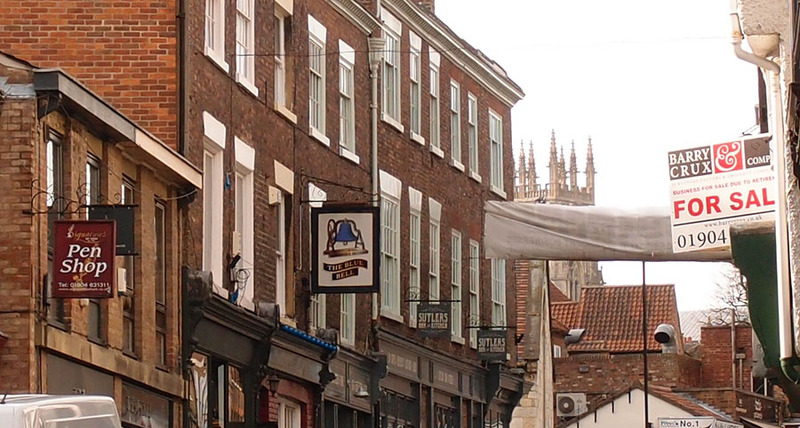 It proposes the installation of a large metal sign across the street at the top of Fossgate. It would be black and silver, and announce the entrance to the ‘Merchant’s Quarter’. It would replace the current plastic banner (shown above) that was presumably meant to be temporary but has been up there for quite a while. It doesn’t particularly enhance the street and so clearly the idea is to put up something permanent with a similar message, to promote Fossgate. The planning application for the sign (17/00159/ADV and associated 17/00071/LBC) has been recommended for refusal in the committee report produced for the meeting. The reasons given for this are, in my view, convincing, and interesting. So I thought I’d share some extracts from the available documents, and also have a wander down Fossgate way today to take some photos. 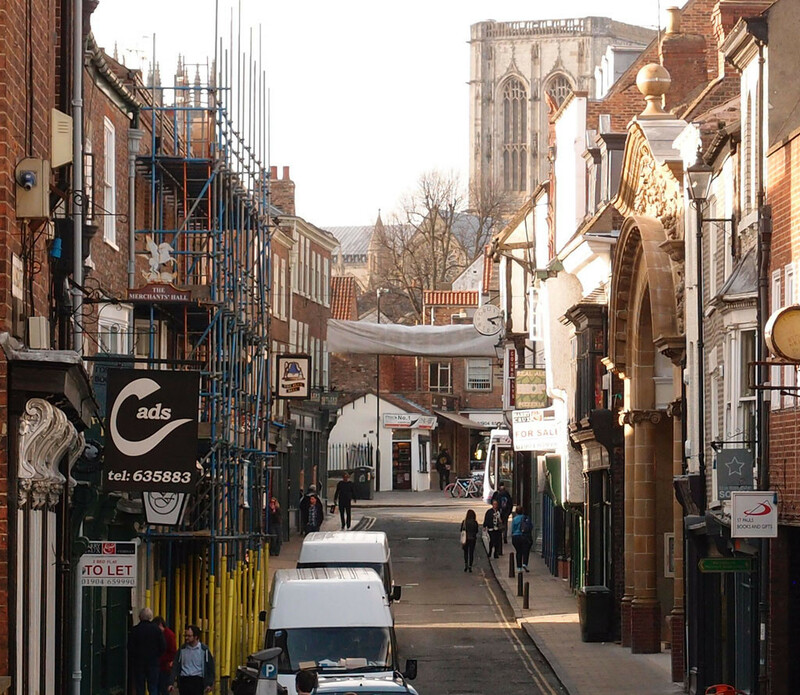 Considering this application leads us to consider the special nature of York’s streets in this area, the routes we walk on our journeys through the city, the views we have when we do. The whole route up Walmgate and beyond to Colliergate towards the Minster (and in the other direction) is an important dynamic and evolving series of historic views. The proposed fixed overhead metal sign in spanning the street clearly interrupts and in some places dominates this integrity of the views of this important route. In deliberately drawing the eye and in placing it across the street (which is highly atypical) this is harmful to the experience of the open historic route. Would a rather fancy metal sign in black paint and silver be any better? The good thing about planning applications and the documents associated with them is that they often provoke thought on aspects of the city maybe forgotten about or taken for granted. Reading the above reminded me that some years ago, when working on Walmgate, I regularly walked from Bootham to Walmgate, past the Minster and along Petergate, down Colliergate and Fossgate, and the description above reminds me of this, of how it was so clearly a historic route. It felt like a straight line, though it isn’t quite, having a slight shift southwards overall, but essentially clearly a through route from one side of the city to the other. The fact that streets were given their own names doesn’t detract from this. The more I walked the same route the more I was aware of how historic and significant it was, the Bootham to Walmgate route. To have a modern sign declaring one particular part of it as somehow an entrance or a special ‘quarter’ doesn’t seem appropriate. 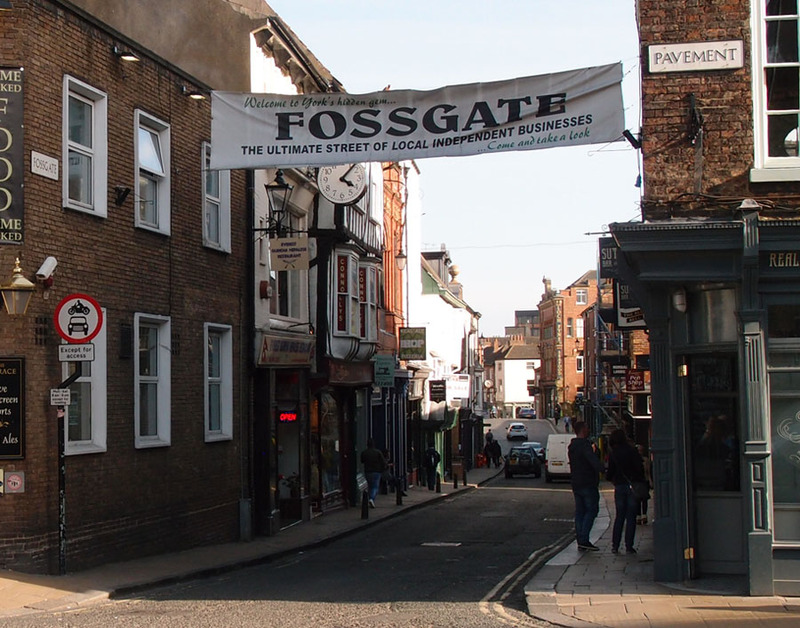 The proposed signage suggests a gateway or entrance, and a separation between Colliergate/Pavement and Fossgate; which is inappropriate because Fossgate is a street that continues from another in each direction. 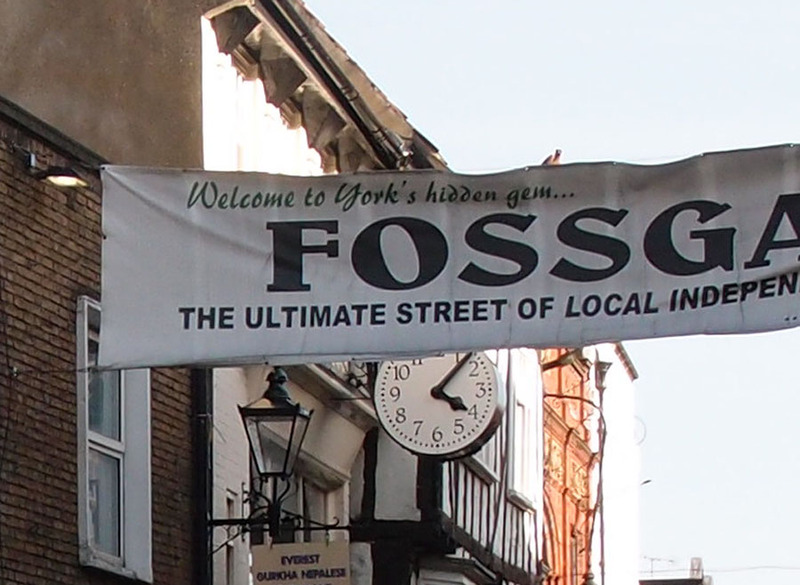 Fossgate is not a separate entity. a natural flow from Colliergate to Fossgate to Walmgate, presenting an attractive array of buildings and a series of evolving views. The view along Fossgate is particularly attractive from Pavement as the road dips down towards the Foss and Foss bridge and on to Walmgate which tantalisingly and subtly disappears from view around the curve in the street. It suggests that ‘to add a metal banner into the foreground of this view adds unnecessary clutter’ and that it is ‘a contrived structure/gimmick in an otherwise historically evolved street’. The proposal in branding Fossgate “Merchants’ Quarter” is a new concept/brand. It is not a recreation of a former structure and, whilst parts of the decoration alludes to a former fish market on Fossgate, such a brand inevitably is not able to represent the historic complexity of Fossgate. In being designed in a quasi historic aesthetic it is potentially historically misleading-constructing a false history. This erodes the value of the historic townscape. The Merchants’ Quarter label is a little odd. References to the ‘Cultural Quarter’ (referring to the area around the art gallery, Theatre Royal and Museum Gardens) used to be common in council documents but the label doesn’t seem to have been generally embraced, as imposing such things tends not to work. Surely these identities for areas only work if the notion of a particular district with a particular theme evolves over time, over a long time, and if it does, it doesn’t need a massive great sign to point it out, as it’s so cool and enticing people are just naturally drawn there? Have to say that all that makes sense to me. I wonder what the councillors who vote on it will think. It is true that Fossgate feels a little cut-off from the main part of the city centre, and the written responses to the application quoted above also recognise that, and suggest other possible solutions. What’s most obvious, from the top of Fossgate, is how for the pedestrian it is cut off by a road — a fairly wide road, compared to the width of the historic route from Petergate through to Fossgate. As illustrated in this photo, taken in summer 2015 on one of the ‘car free’ days. Kerbs and tarmac effectively delineate the road and pedestrian space, as tarmac and pavements with kerbs tend to do. Changing the paving at this junction here to flatten it and subtly emphasise pedestrian ‘flow’ towards Fossgate would be more effective perhaps, as suggested in the documents quoted above. Thinking of that walk I mentioned I used to do, from Bootham to Walmgate, what also comes to mind is the way parts of it open out, lessening the sense of the historic route. Two substantial alterations to the medieval street pattern blasted holes in what would have continued as a fairly narrow and built-up route. Firstly on Petergate, where Duncombe Place was created to open up a view of the Minster, and then here in this area as we approach Fossgate, where suddenly there’s the opened out area to the left, with the hulking bulk of Stonebow House and the street of Stonebow next to it. A 20th century intervention. It’s that that has cut off Fossgate from the streets it used to be more closely linked to. Clearly removing the road isn’t an option but that unhappy junction where it meets Pavement and Fossgate and Whip-ma-whop-ma-Gate could be improved with paving changes, the kind that make pedestrians claim the space and any buses and taxis slow down. 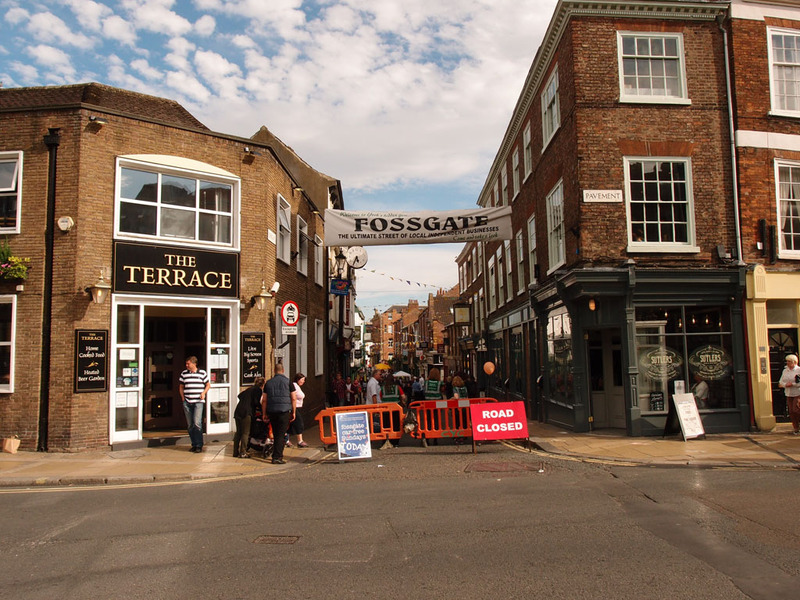 Fossgate seems to be quite a dynamic and happening place already, and clearly there are many significant developments underway or recently completed close to it that will mean more local residents and more passing shoppers. The Hungate development continues, with another phase of residential build apparently almost complete. Stonebow House, a stone’s throw away, is being remodeled, which will also involve some tidying of its scruffy end near the top of Fossgate. At the other end, there’s student housing down the road in Walmgate and another block planned. Then there are the proposed developments in Piccadilly – the Spark:York plan, or the hotel, or maybe both. Presumably with the large student population living in the blocks down Walmgate this is where, increasingly, Fossgate’s customers come from. There’s been a huge cultural shift in this area. Several established businesses frequented by a previous generation of York residents have disappeared: the furniture store in the old cinema building most recently (soon to be a restaurant) before that the Barbican Bookshop (now a cafe) and Army and Navy Stores (now Sutlers bar). There are of course many small independent businesses down here. Fossgate really suffered in the recent floods at the end of 2015. Some of the businesses down there had a horrendous time. They and all other city centre small businesses deserve our custom and support. But I can’t see how a dominant sign at one end of Fossgate will help with that. It was only today, getting back with the photos I took and looking through them, that I remembered the clock, visible on the photos on the building next to the banner. It wasn’t working when I took the photo in 2015, but it is now, and very handsome it looks too, as well as being useful. It was recently restored, as covered by the Press (there are more photos on this link, from BBC York on Facebook). ‘It means a lot to see the clock back up. When we decided to take it down, we didn’t know whether to scrap it or renovate it. We chose to renovate it to keep the character of the street the way it was for over 100 years’, said Maurice Woollons, whose family own the building. The current banner obscures it and presumably the proposed replacement would too? Which doesn’t seem right. The matter will be discussed and decided upon at the meeting starting at 4.30 on 6 April. There will be a webcast (www.york.gov.uk/webcasts), which is always available to watch later too on the council’s YouTube channel if you can’t watch live. The weekly additions to this website are usually added on Thursdays, but I’m going for an earlier one this week. There should be at least one page a week, on Tuesdays, Thursdays, sometime or other, depending on various factors (time, enthusiasm, etc). If you’d like notifications by email every now and then please join the mailing list, or alternatively, follow me on Twitter. No sign. Why? everyone will want one Goodramgate,Mickelgate. Yes, a sign would be useful to direct people down Fossgate.